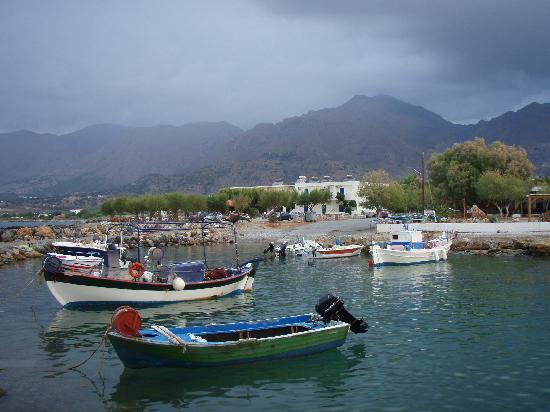 Frangokastello Crete Φραγκοκαστελλο is a tiny village on the south coast of Crete in the Chania region. The intriguing ruins of a Venetian castle lend a mysterious air to the seaside village. Located about 75 km from Chania town, the nearest large village is Chora Sfakion, 12 km away. With the mountains rising high up behind the coastal plain, there is the feeling that no one knows where you are. There are also the tales of ghosts walking from the castle, so be sure to ask the locals about this. 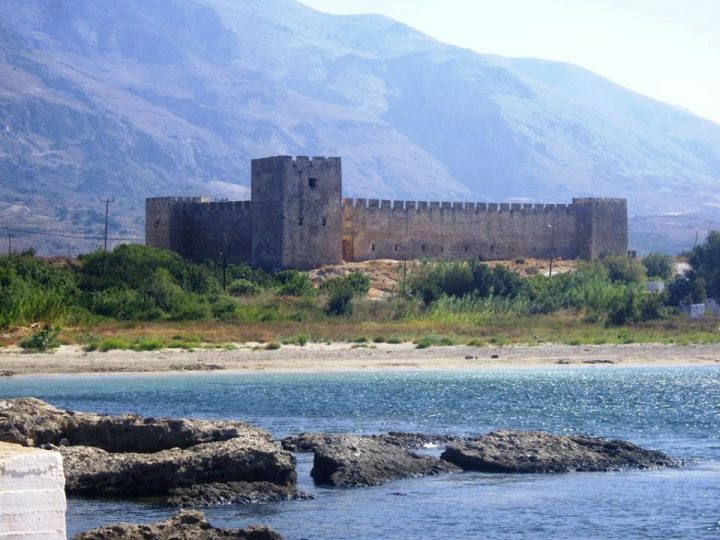 The castle lies in the region of Sfakia, a mountainous region of reclusive and defiant peoples who rebelled against any force that tried to subdue them, and still today the region is renowned for its pride and Sfakian bravery. With the small flat plain, sheltered beaches with little or no surf, and its relative isolation, this little village is good for families looking for a quiet, relaxing and simple beach holiday, and for those with an interest in history. The history of the site of this village goes back to the bronze age, and also in the area around here are Minoan sites dating from 1800BC. 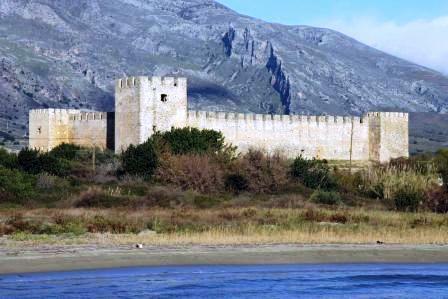 After Arabs, pirates and Turks came the Venetians who reconstructed a fortress on a site previously occupied. The construction date was 1371. The fortress was very basic, as this was an outlying post, not a full commercial centre such as those towns on the northern coast. 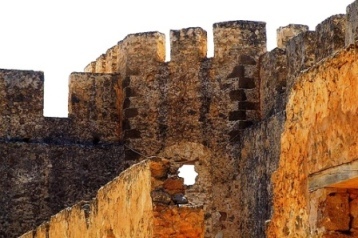 The four towers were linked by battlements forming a rectangular building. Outside can be seen the coat of arms of the Lion of St Mark, representing the Republic of Venice, inside were kitchens, barracks, stables, storerooms, ovens and suchlike which do not remain intact. 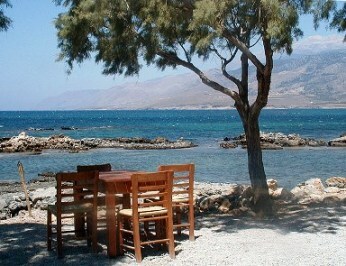 Flisvos Hotel and Taverna is located right on the water at Frangokastello. With a few rooms and a homestyle tavern, this is a low key, genuine family hotel run for many years with the hospitality of Spiros and Stelios Vranakis. The word 'flisvos' sounds like the gentle murmur of the waves as they break on the beach... Here is a place to relax and let the cares of the world dissolve... 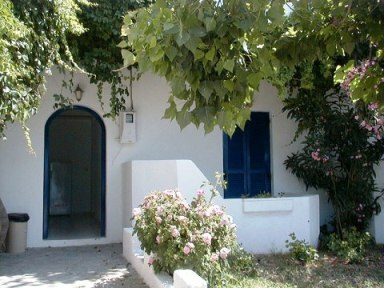 The Vranakis brothers also have a few apartments and a couple of renovated houses close by so it is a good idea to see them for your accommodation needs.